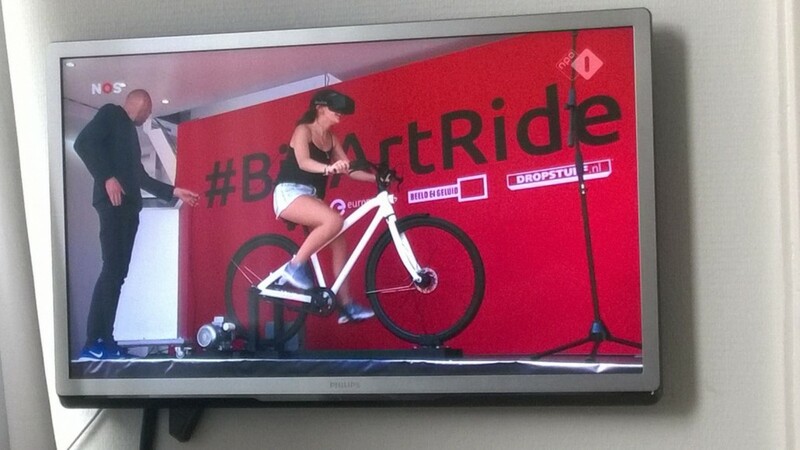 A virtual bridge through Europe with virtual reality, art… and cycling! #BigArtRide – the European Tour, initiated by DROPSTUFF.nl in collaboration with Europeana, the Netherlands Institute for Sound and Vision and the Embassies of the Kingdom of The Netherlands through Europe, is a new cultural media project which connects citizens all over Europe with each other in a unique VR-cycling game. Cycle through the city of the future, filled with shared cultural heritage! During the months april, may, and june of 2016, an installation will travel on two DROPSTUFF.nl-trailers with LED-screens and a bike-installation: one trough Amsterdam, and one through nine different European capitals. Every time participants will be invited to step on the bike, put on an ‘Oculus Rift’ VR headset and navigate through a virtual city full of highlights from ages of European art. Read more about the #BigArtRide on the project page. Follow the project on our facebook-page.